If there’s any doubt that students can be the source of the some of the world’s most exciting innovations, consider Microsoft’s Imagine Cup, held this week in St. Petersburg, Russia. Now in its 11th year, the event hosted 87 student teams from 71 countries – along with judges, dignitaries and media – to showcase projects in Innovation, Games and World Citizenship. The competition also featured three product-specific challenges (including app development for Windows 8), and eight special awards. Over the coming months, we hope to talk to many of these innovators here at Daily Edventures. Our past interviews with Imagine Cup participants – like Wilson To and Mexico’s Team Reimagine – have proven to be among our most inspiring. After all, these student teams have succeeded not only by winning a major global competition, but also by making a real difference in the world. The projects aim to solve pressing, real-life problems, and many of the student innovators go on to expand their ideas into thriving enterprises. We’re thrilled to announce these latest Imagine Cup winners, and hope that their stories will provide inspiration for the aspiring inventors and entrepreneurs in your classrooms. 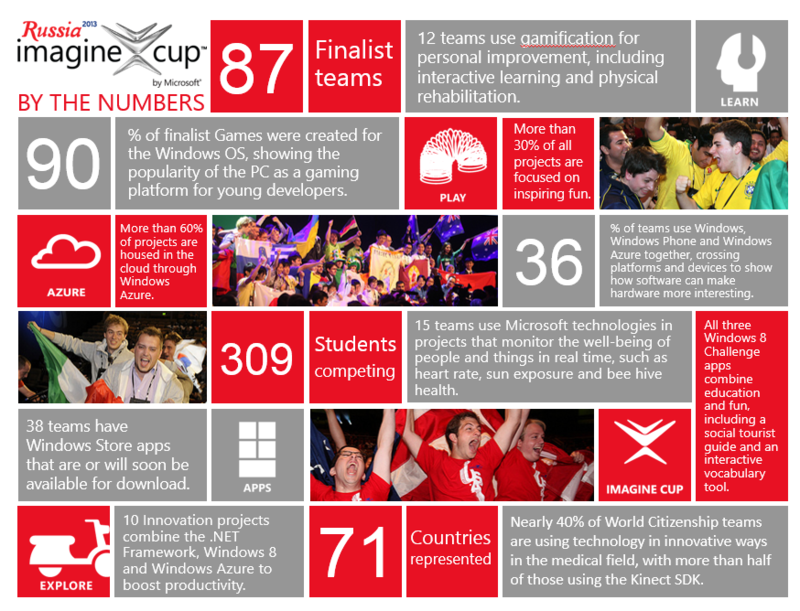 This entry was posted in Information and tagged Imagine Cup, Student empowerment. Bookmark the permalink.